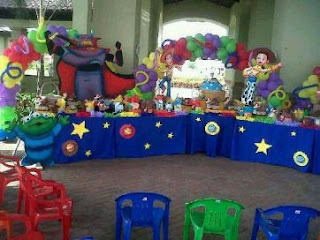 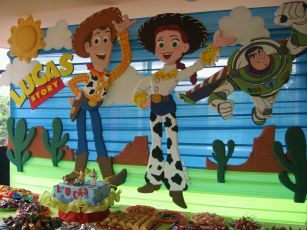 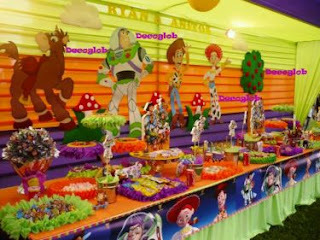 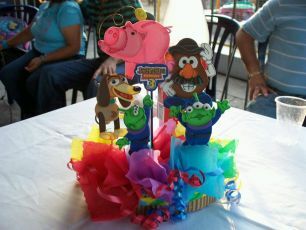 You can choose arches of balloons and of course the characters in the Toy Story saga, if in addition you complement this with a blue tablecloth and the image, your decor will be successful. 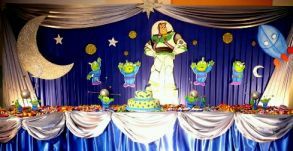 If the party is in a closed room, but in an outdoor environment, the ideal is to use cloth pads or tents, remember that if you do not use tents must have ceiling environments in order to place there tables and chairs. 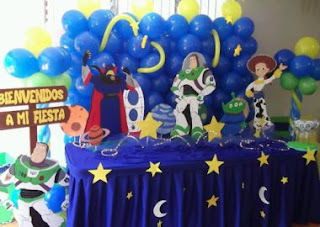 Another decorating idea with the pattern maked by balloons, remember that you can use all the toys in the film or you can choose one in particular, the color of the cloth is also very important and is a great complement to the decor remains perfect. 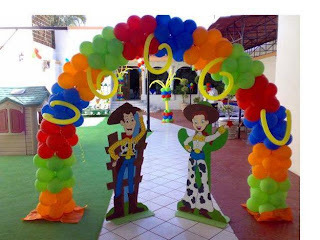 The following is a great idea to decorate an amusement park, parks are often attractive in themselves, why they do not need more features, for example in the picture you can see an arch of balloons with some of the toys to welcome the guests into the park can also place other arrangements with balloons. Two beautiful examples of how well they are cloth and fabric awnings , its use is ideal for outdoor celebrations, and if you want you can add pictures, linens, fountains, ornaments, and everything that has to do with the theme. 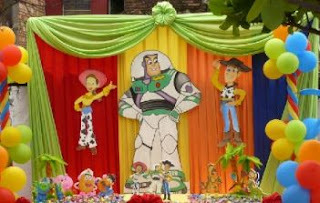 On the other hand this is a different option, these cloth pads placed indoors, taking care to properly combine the colors of the awnings and tablecloths, obviously the film's toys are also present. 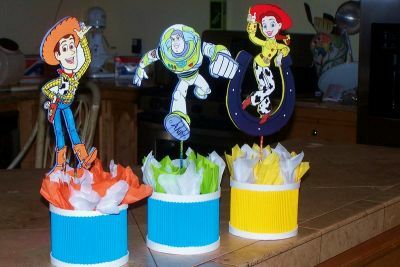 Finally, some other accessories to complement the decor, are these interesting centerpieces that can also serve as surprises for the guests.